Full disclosure: I love snow. I’ve been sitting around rooting for snow since the weather started dropping below 40 degrees. Yes, it makes driving a challenge; yes, the salt stuff that they put everywhere completely ruins shoes faster than any other substance known to man. Still I think snow is pretty darn magical. Case in point: these gorgeous up-close photos of snowflakes. So I thought that I’d do a snow inspired combination. Just something quick, so no meticulously hand painted or perfectly stamped snowflakes here. Think more along the lines of glistening drifts of snow. Errr, then lower your expectations a bit. I used Zoya “Blu” underneath Julep “Camille”. 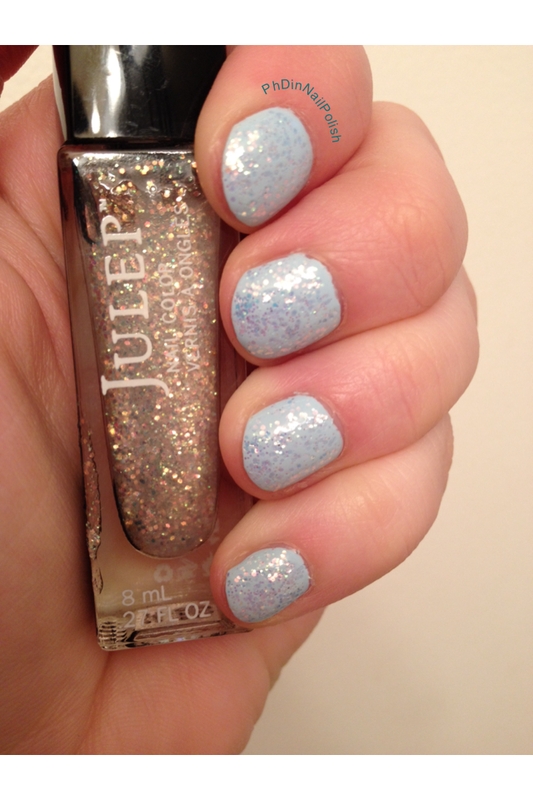 Blu is a very light blue creme shade and Camille has small iridescent glitters in a clear base. I adored how the glittery top coat looked, but I have to say that the Zoya polish underneath was a real problem. First, the stuff went on like white-out, thick and chalky. Worse, it didn’t cover well, refused to level out, and dried very slowly. I ended up having to use three coats, and it felt very thick on my nails. The polish on my thumb squished off an hour after I finished, which I was displeased with. As a look, I think it works, but if you’re planning on recreating it, I strongly suggest that you pick a different base color. I’m thinking maybe Essie’s Winter 2013 “Parka Perfect” (which, incidentally, is sitting on my desk waiting to be swatched). Edit: Evidently I wrote “slowflakes” the first time I wrote this post. It is one of those days. I am a slowflake.